WASHINGTON (April 13) -- Except for dying, about the only thing more certain than taxes these days is the fierce debate about how to cut them. 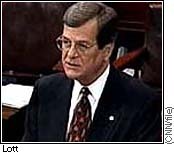 The White House suggests $24 billion in tax cuts over five years, Sen. Trent Lott says $30-45 billion, and some House members want $60 billion or more. These macro-style numbers are only part of the larger great tax debate, with lawmakers considering massive fundamental changes to the tax system, including moving away from the progressive income tax, for example, to a flat tax or national sales tax. But while it's unclear if any of these monster issues will get resolved, it appears likely that Congress will approve some specific targeted tax cuts to follow up on last year's reductions, which totaled more than $93 billion. President Bill Clinton is opposed to the idea of a sweeping across-the-board tax cut, saying it's more important to shore up Social Security to withstand the coming wave of Baby Boomer retirements. He has, however, suggested targeted tax incentives for education, child care and the environment. The top target of the GOP-led Congress this year is an end to the so-called "marriage penalty," a feature of the tax code that results in some couples paying more taxes once they get married and begin filing joint returns. Many couples who file jointly wind up in a higher tax bracket than if each person filed separately. A proposal to boost the standard deduction for married couples would cost about $29 billion over five years. 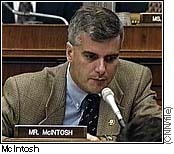 Reps. David McIntosh (R-Ind.) and Rep. Jerry Weller (R-Ill.) have introduced the "Marriage Tax Elimination Act" (H.R. 2456), and both McIntosh and Weller have detailed descriptions of their proposal on their Web pages. There also is a Senate version (S. 1314) by Sen. Kay Bailey Hutchison (R-Texas). Eliminating the so-called "marriage penalty" was one feature of the GOP's "Contract with America." Some Democrats also support the idea, but until a healthy economy boosted tax revenues and brought down the deficit, Democrats wondered how to pay for the change. Creating so-called "Personal Security Accounts" and letting workers invest a portion of their Social Security payroll taxes in stocks and mutual funds. Expanding the tax benefits of education savings accounts. Expanding capital gains tax cuts beyond what Congress approved last year. Eliminating estate taxes. Republicans call the tax on assets after death the "death tax." 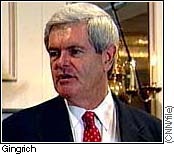 House Speaker Newt Gingrich frequently mentions his desire to do away with them. Exempting the first $400 of interest and capital gains income from taxes, a move suggested by House Ways and Means Chairman Bill Archer (R-Texas). Making Social Security payroll taxes deductible, as proposed by Sen. John Ashcroft (R-Mo. ), a possible contender for the GOP presidential nomination in 2000. Allowing self-employed people to deduct all of their health insurance premiums. Exempting pre-paid college tuition plans from taxes. Last year, as part of the balanced budget deal, Congress approved a series of incremental tax reductions, cutting the top rate for capital gains to 20 percent; creating a $400-a-child tax credit; and boosting the exemption for estates from $600,000 to $1 million over 10 years; and creating a $1,500-a-year education credit for college.